Alwar Balasubramaniam, Study for a liquid mountain, 2017–18, fiberglass, iron, 111 × 56 × 56". On a road trip from Las Vegas to the Grand Canyon in 2009, Alwar Balasubramaniam decided to make a pit stop at the Carlsbad Caverns in New Mexico. He wasn’t disappointed. The underground caves, with their cathedral-like aura and magnificent natural formations, enthralled him, planting the germ of an idea. A decade later, this vision of stalagmites conjured by slowly dripping water informed his sculpture Study for a liquid mountain, 2017–18. 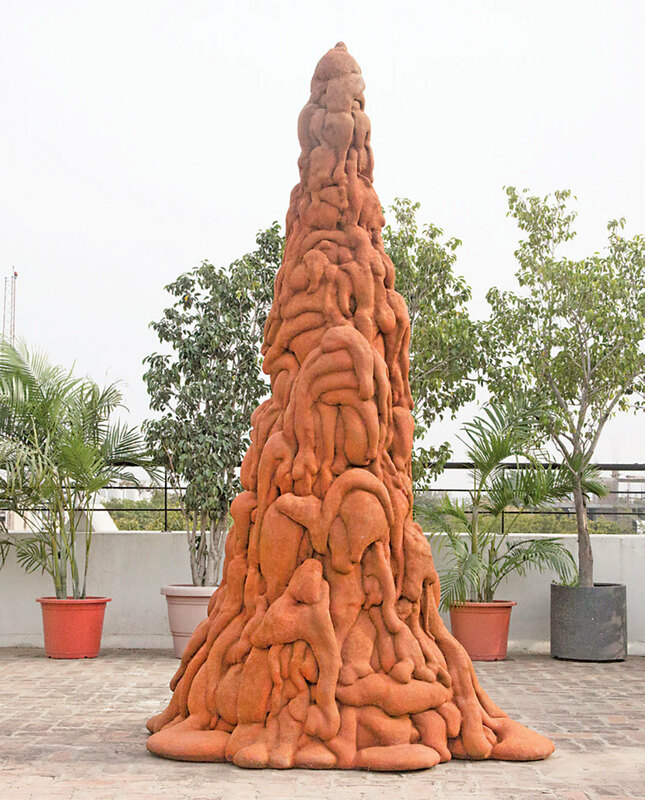 Situated on the rooftop of Talwar Gallery in Balasubramaniam’s recent exhibition “Liquid Lake Mountain,” the towering fiberglass-and-iron structure appeared to be fashioned out of a molten mass of entwined roots, tree trunks, and bodies both human and animal.